I drew a couple of these a while back, and I’m posting them now both to fire discussion and because I’m too lazy to write anything new. Here’s the neck of Apatosaurus, my own reconstruction based on Gilmore (1936), showing the possible paths and dimensions of continuous airways (diverticula) outside the vertebrae. Here’s figure 4 from Lovelace et al. (2007), which first got me thinking about pneumatic traces on the ventral surfaces of the centra and what they might imply. 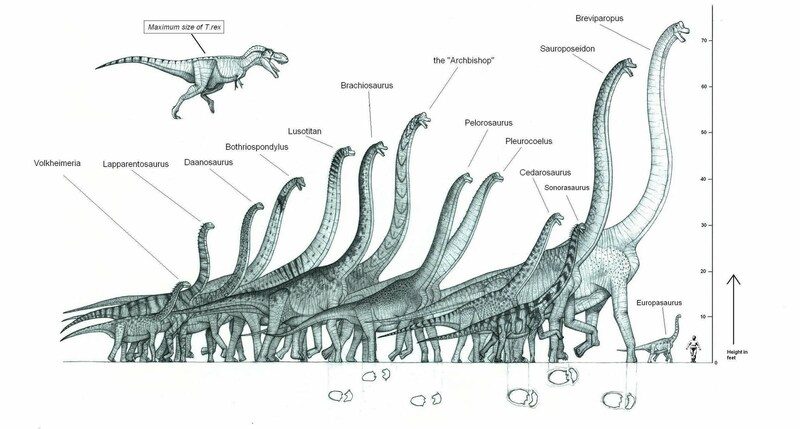 You can see pneumatic spaces between the parapophyses in Supersaurus (A) and Apatosaurus (C) but not in Barosaurus (B). How bulky you make the neck depends mainly on how much muscle you think was present (which of course depends on how heavy you think the neck was…). Here I was just trying to get the relationships right without worrying about bulk, but it’s worth considering. 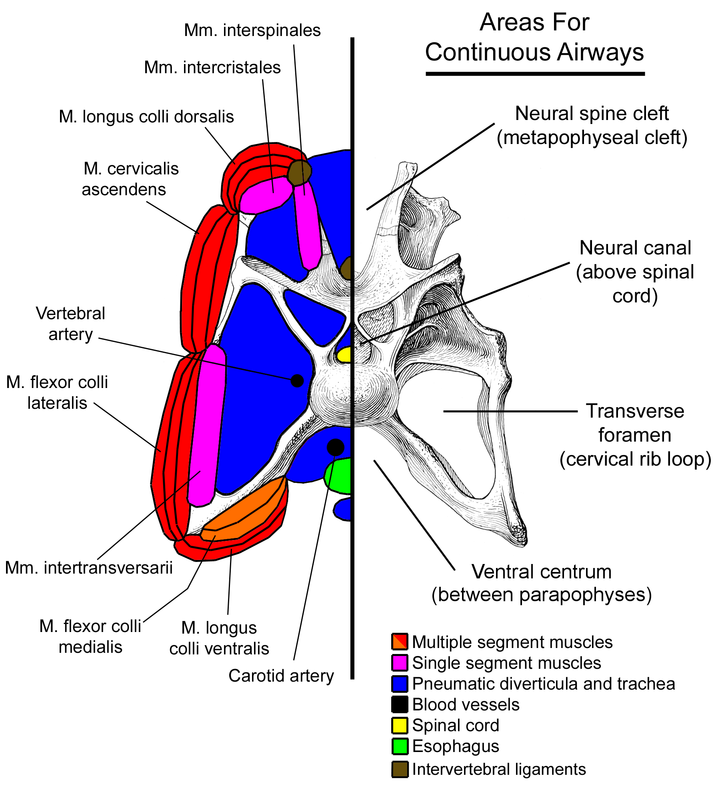 The volume of air inside the vertebra was dinky compared to the probable volume of air outside. In Apatosaurus, either of the canals formed by the transverse foramina has almost twice the cross-sectional area of the centrum. A fair amount of this has been superseded with better data and prettier pictures by Schwarz et al. (2007), so don’t neglect that work in any ensuing discussion (it’s free, fer cryin’ out loud). And have a happy Thanksgiving! Lovelace, D.M., Hartman, S.A., and Wahl, W.R. 2007. 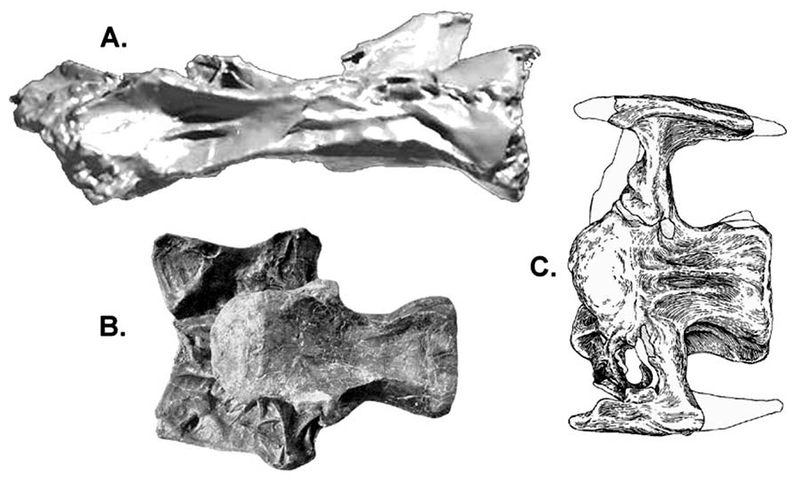 Morphology of a specimen of Supersaurus (Dinosauria, Sauropoda) from the Morrison Formation of Wyoming, and a re-evaluation of diplodocid phylogeny. Arquivos do Museu Nacional, Rio de Janeiro 65(4):527-544. Schwarz, D., Frey, E., and Meyer, C.A. 2007. 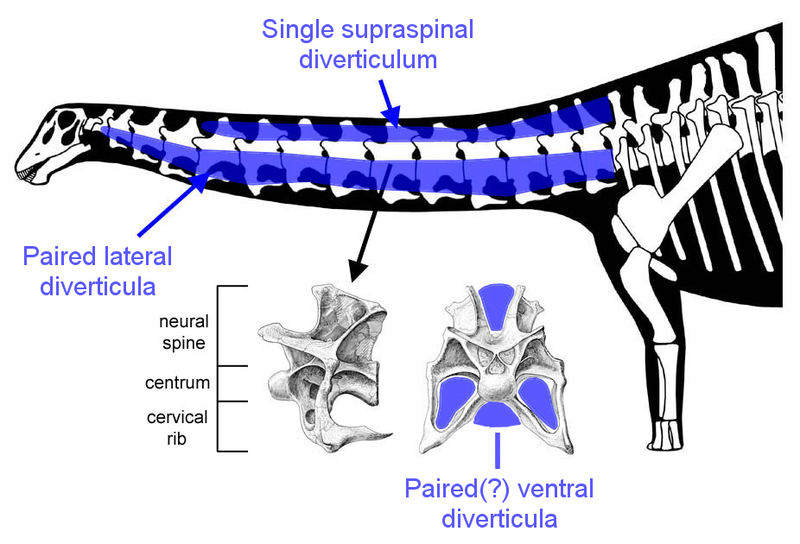 Pneumaticity and soft−tissue reconstructions in the neck of diplodocid and dicraeosaurid sauropods. Acta Palaeontologica Polonica 52 (1): 167–188. Mike asked me to add the labeled version of Nima’s brachiosaur parade, so here you go. Click to embiggen. I was lucky enough to see the Supersaurus mount this weekend. Consider me blown away! Out of curiosity, is there currently any general consensus on the kind of muscle mass required to move those necks, or are there too many variables to consider to have any kind of uniform idea? To clarify, what are the minimum realistic estimates that you’ve come upon? Taking bets on who the T. rex it about to land on. It depends on how much forward momentum it has. That was quite a hop. Tor, so far as I know no work has been done on how much muscle sauropod necks carried, and all published restorations so far rely on intuition. As you can see in a previous post, that intuition has varied quite a bit between different authors. Matt’s version in this post is a better match for Daniela’s than Greg’s. – Pick a well-known and well represented neck, e.g. that of the Diplodocus carnegii holotype CM 84. – For the first vertebra, calculate how much muscle is needed to support the head plus the relevant length of plumbing. – For the second vertebra, calculate how much muscle is needed to support the head and first vertebra plus the relevant length of plumbing. – And so on until you’ve done the whole neck. Needless to say, once you start to think about this in any detail, there are a hundred reason why it’s harder than it sounds. I still think it might be worth attempting, if only to attract the criticism that might make a second version useful. But since I have so much else going on right now, I happily put this idea in the public domain: anyone who wants to take a stab, please feel free. Which “Pleurocoelus” is that in the figure? Is it meant to represent the Maryland material, or one of the western specimens? It’s the child of a long-distance interracial relationship between the two types! I got some ideas from Greg Paul’s painting of Pleurocoelus having his rear bitten by Acrocanthosaurus on a muddy floodplain. He sent me a photocopy of that painting a long time ago, and I think that’s been pretty much the default Pleurocoelus shape ever since – long arms, long torso, but a shorter neck than Brachiosaurus, and probably with a gentler slope… though there’s plenty of speculation to go around. Mostly I stick to the classic vertical “swan neck” for brachiosaurs but in the case of the more titanosaur-like ones such as Pleurocoelus and Cedarosaurus, I make a little exception. These guys might form a sub-family within Brachiosauridae – the “Pleurocoelinae” or something like that, based on their wider-gauge limbs and other features that are more titanosaurian than the rest of the family (which I call the “Giraffatitanae”). 1. It should be obvious to all right-thinking people that this is the single greatest piece of artwork ever executed by anyone, anywhere, at any time in history. The only way it could ever be improved upon would be if more brachiosaurs were discovered and incorporated into a new draft. Here’s the deal on Pelorosaurus. First, its nomenclatural history is all mixed up with Cetiosaurus brevis, as recounted in detail by Taylor and Naish (2007:1559-1560). That is, happily, being sorted out as a by-product of the ICZN petition on Cetiosaurus (Upchurch et al. 2009). Once the Commission accepts the petition (and there’s no reason it shouldn’t), C. oxoniensis will be type species of Cetiosaurus, and the only-distantly-related species “Cetiosaurus” brevis will need to be removed to a separate genus, for which the available name Pelorosaurus is the obvious choice. Confusingly, this means that the species generally known as Pelorosaurus conybeari will become Pelorosaurus brevis (well, it will revert to that name really) as the species “C.” conybeari was a junior objective synonym of “C.” brevis. This means that the type specimens of the species (and hence the genus) will be the four proximal caudals formally known as “Cetiosaurus brevis” and the humerus that was the founding specimen of the genus Pelorosaurus (which had no species at that time) will either be a referred specimen, or will be added to the holotype since it is most likely part of the same individual. OK, on to the next point! 3. Nima wrote that he drew “Brachiosaurus (B. brancai HMN XV2 in this case – no I am not calling it Giraffatitan. Deal with it!)”. Sorry but this is just plain wrong. Giraffatitan is not Brachiosaurus as I think I’ve demonstrated pretty convincingly. If you do insist on referring to Giraffatitan as a species of Brachiosaurus, and if you consider genera to be monophyletic, then it’s likely that half your other brachiosaurus are also species of that same genus. B. and G. are very different. What’s sadder is that by considering them congeneric (and by drawing genera rather than species), Nima denied himself the opportunity of showing the big proportional differences between them (Taylor 2009)). 4. I guess the idea that the Archbishop is bigger than Giraffatitan must come from something I wrote at some point: if so, sorry to have misled you. The Archbishop is actually if anything a little smaller than Giraffatitan (and, I think, with a proportionally shorter torso). Can you please point me to where I made the misleading statement so I can fix it? Where can I read more about this? I always heard the Texan specimens were middle-sized sauropods; certainly the Glen Rose tracks aren’t that huge. It would make sense that Texas would have giant sauropods though! The scale of Brachiosaurs is very interesting, however I have two objections to these calculations. Breviparopus not be a footprint similar to Macronaria by Parabrontopodus on the distance of both legs, the hand shape and direction of their nails. Nougaredi Brachiosaurus was 4 sacral vertebrae 1.3 feet long, which corresponds to a larger sauropod that Sauroposeidon. These are the scales so far led Brachiosauridae compared. The tables will get updated as new evidence or new specimens are discovered. The English to Spanish translator changed the data in my previous message. Brachiosaurus nougaredi was 4 sacral vertebrae which reached 130 centimeters in length total. But as noted previously on SV-POW!, the sacrum of “Brachiosaurus” nougaredi is very strangely proportioned — much longer than B. altithorax, but much narrower, too. This alone is reason enough to be very doubtful of its brachiosaurid identity. I’d need to see the material, though, or at least some good figures, before committing further. Now to clarify a few points; I do not deny that Brachiosaurus and Giraffatitan are different in many ways. I read your paper and it’s a truly excellent paper, all the points are well-argued. And the skeletal definitely shows Brachiosaurus altithorax was a different-looking animal. However my ‘Brachiosaur Parade’ was mainly intended to show the different maximum sizes and likely appearances of an array of brachiosaurs, not to compare major morphological differences between two of them. I used the more classic term Brachiosaurus because it’s still more popular for “B” brancai, and I’m still a bit loath to call it by a different name… guess that’s the Bakker in me coming out. My comment that “I’m not calling it Giraffatitan” was not meant as a jab at anyone, but rather a humorous reluctance to discard the more popular name for a creature that most depictions of “Brachiosaurus” have been based on. Yes I may be wrong but I think time will bear that out. On the more serious side, I don’t fully agree that if the two were the same genus, that other brachiosaurs would also be in that genus… for one thing, the Archbishop is considerably different from both of them in many features of the vertebrae, including length-height proportion. For another, the wider-gauge Pleurocoeline forms from the early Cretaceous vary considerably from “Brachiosaurus” remain of any sort. Finally the inclusion of those cervicals in the skeletal which are referred to “Brachiosaurus sp.” seems to indicate that this is still a genus with much left to be discovered about it, so it may be in a state of taxonomic flux for a while. I think B. brancai may still have some merit, and judging by how evolution sometimes happens in strange unexpected ways, even the best cladistics analysis can sometimes be off. (not that I’m implying yours is off, but even cladistics inevitably has its limitations). As for the Archbishop, I didn’t make it significantly bigger OR smaller than Giraffatitan in the actual piece – I simply gave it a longer neck. I don’t doubt that some individuals may have grown bigger than Giraffatitan (perhaps even bigger than XV2). But since this restoration was intended to show “maximum” expected sizes, I did scale it up a little bit. As for Pelorosaurus, the fact that this taxon is so tangled up with Cetiosaurus and some probably Titanosaur stuff made me consider not even drawing it! But then I figured, there is SOME Brachiosaur material in there somewhere, and the name itself is better known than say, Eucamerotus or Ornithopsis, so I figured I’d put reasonable-sized Pelorosaurus representing the brachiosaurid material in there. I suspect that the B. nougaredi sacrum may have been laterally crushed, which would account for at least some of its reported narrowness. If it’s not a brachiosaur, I don’t see what else it could be considering the narrowness of the thing… and I don’t even know if the ilia were found with it. So yes, I admit the Breviparopus figure is so far very speculative, however I wanted to make sure that this speculation was executed with style – and with maximum accuracy based on what’s known about brachiosaurs. If it was a brachiosaur, this is what it may well have looked like. I see so many artists drawing not just speculative but even COMPLETELY known sauropods (i.e. Diplodocus) with all sorts of blatantly wrong things like hand hooves, elephant-padded hands, plantigrade feet and multiple hand claws, passing it off as “real lifelike dinosaur” and NOT even admitting the necessary caveats that their work is very fanciful and may not be totally accurate (I agree with Darren’s post on TetZoo, this is a real problem and more PhDs publishing dinosaur books should correct their artists where necessary)… so I’d much rather my speculative Breviparopus become the iconic image of that genus than theirs, for the sake of respecting the actual science and evidence. Breviparopus is a narrow footprint, so it would be different than those in the Macronaria. It may be of a similar Diplodocidae Apatosaurus by the shape and number of fingers with nails. Interesting, but that seems a bit odd, Rexisto… If the remains were destroyed in WWII, then how did Lapparent describe “B” nougaredi as late as 1960? Lapparent was French and he dug up the sacrum in Algeria back in 1960 when the French still had a big presence there. It was not found by Lydekker, so I can only guess you’re referring to another giant dinosaur that actually got bombed in WWII… perhaps “Aegyptosaurus sp.” but that was Stromer, not Lydekker. And I don’t know if Lapparent published any pictures of the sacrum at all. To my knowledge the only super-huge sauropod that Lydekker had to his name is Argyrosaurus. Which is still in good shape (actually I’m surprised how many huge bones have been referred to it over the years). As for Breviparopus – I know this is nitpicking, but the footprints are not narrow at all, the handprints are – and while it may have narrow hands for a sauropod, I doubt it’s a diplodocid for a couple of reasons. First, diplodocid thumb claws were long, and attached to the hand well above ground level due to the shortened 1st metacarpal (same with camarasaurids). They would not leave thumb claw prints at all, or perhaps a tiny dot separated from the manus print at most (made the tip of the claw). So the presence of Breviparopus’ short thumb claw prints attached to the manus print makes it far more likely that this was a small-clawed Brachiosaur than anything else. It must have been a very weird braciosaur indeed, with super thin hands (but brachiosaur hands are already slender and elongated, so it is possible) and also some manus prints are a good bit wider than the others, indicating that some of the apparent “narrowness” is due to the walls of the prints having collapsed inward due to their original wetness (the same effect appears in the pes prints too). Second, if the early cretaceous dating estimate is to be believed, then diplodocids were already extinct by then (though rebbachisaurids and dicraeosaurids were not, but they were nowhere near big enough to have made the Breviparopus prints). *A size and age roughly similar to Sauroposeidon and the Wealden brachiosaur – this was a time when brachiosaurs flourished and diplodocids were dust. *And it’s also in Africa, a macronarian stronghold, not to mention it was found in the same general region as “Brachiosaurus” nougaredi. The case for a brachiosaur identity is looking good. Not perfect, but certainly good. Thanks for answering and for correcting me, actually answered so fast that apparently made several mistakes. Not that describes Lydekker nougaredi Brachiosaurus, but Lapparent. Apparently the remains were destroyed, as the holotype of other dinosaurs as with Spinosaurus. I was not sure, but the pieces really are lost. Lapparent if you have some photos of the sacrum in the official publication which describes the species. However, it is the fossil in the land and without a clear background. The narrowness which I mean that of Breviparopus not exactly on the mark, but the distance to one another. For example, we know that Macronaria had a wide body and its traces (Sauropodichnus, Brontopodus, “Ultrasauripus” were far apart. While not Macronaria of sauropods were in a very narrow line (Parabrontopodus, Breviparopus, Polyonichnus). Some authors, whose appointment I need to include in this message but still pending at the moment include Breviparopus footprints in the family and subfamily Diplodocidae Apatosaurinae, by the shape of the hand, nails, separation of the traces walking and the corresponding time. The hand is not shaped like a horseshoe, a characteristic of Brachiosauridae, but crescent-like features of Diplodocidae and other primitive sauropods. The nails of the feet point forward, while those of Brontopodus point Parabrontopodus and sideways. Breviparopus not have the characteristic Brontopodus heel, a taxon associated with Titanosauriformes and Brachiosauridae. Breviparopus is estimated as belonging to the Late Jurassic or Early Cretaceous. The Rebbachisauridae can also compete as potential perpetrators of this taxon, or even more primitive group. Brachiosaurus nougaredi is belonging to the Albian – Cenomanian and does not correspond to the time it was Breviparopus Upper Jurassic or Neocomian. Thanks Matt for elucidating these important airways! The questions arise, did they contain different gas mixtures? and where/how were they connected/patent? As discussed previously, acoustic resonance effects can be surmised within these chambers: possibly with functional amplification for both vocalisation and audition (humming and appreciating). It is worth considering release of NO from mucosa lining these chambers. NO is “Not combustible but enhances combustion of other substances”. If present with oxygen and ammonia, might a flammable, even self-igniting, mixture arise? One must then ask, was ignition intracorporeal, leading to expiration (in either sense! ), or extracorporeal, following expiration of the gas mixture? On this point, the literature is inconclusive and not even clearly indicative. This may be due to very short timescale of the phenomenon, rarity of its occurrence, impracticability of close observation, and prompt demise of any proximal witnesses. The muscles you show enclosing these chambers would provide for these: distension inflation, expansion on ignition, and elastic recovery thereafter, ejecting the combustion gases (I surmise) forwards; whether orally or nasally (or through novel autapomorphic de novo orifice or orifices), is not here discussed. The long neck of sauropods is thus seen to serve multiple linked roles: as incendiary reservoir, directable nozzle, and health-and-safety feature (keeping emitted combustibles and the resulting conflagration safely remote from its own body). I suggest that the immediate sequelae of such ignimission would be a prudent backing away, turning away, or triumphant rearing.. up, up and away.. Wait a minute…. only FOUR sacrals? Brachiosaurs normally have five. And given this length it was still strangely narrow… if you had the fifth sacral, it would be even MORE oddly proportioned. My best guess here is that these sacrals LACK the sacral ribs or only contain part of them, and were not measured at their widest point. This is why the measurements seem so long and narrow. I can only assume that no trace of the Ilia was found, otherwise the specimen would be a lot wider. The only thing I would trust here is the combined length of the 4 sacrals, since with different levels of damage and lack of ribs, their individual widths could well be incomplete and non-diagnostic. And if it’s a total length of 130cm, then I’d assume the average length of a sacral is 32.5 cm (divide 130 by 4)….. so adding the fifth sacral could feasibly add another 32cm to the thing. This would make for a length of 162 cm, which is insanely big. Certainly big enough for a creature that made 90cm wide footprints. As for Rebbachisaurids in the Cretaceous… none of them got that big, so it’s doubtful. Furthermore, one of the right footprints distinctly shows the claws sweeping sideways as in Brontopodus. The foot claws had some flexibility in all neosauropods, though they were not prehensile. The claw print angle depends on what the creature was pushing against with each foot. In any case, I was not making the case that Breviparopus was similar to Brontopodus – I merely said it was probably a brachiosaur, I said nothing about it being a Pleurocoeline brachiosaur. If anything, it was a derived Giraffatitanoid. The crescent hands do not disprove the brachiosaur theory, they merely indicate this animal had narrow hands that were modified differently from Brontopodus. This is not necessarily an exclusively non-macronarian trait. In fact, diplodocid hands when properly assembled tend to be more curved than this also. And the narrow gauge does not contradict a brachiosaur origin either. Most “classic” brachiosaurs had narrow gauge and deep torsos. Only the Pleurocoelines had wider torsos and more titanosaur-like trackway gauge. 1. thumb claw print attached to hand print – meaning the thumb claw was attached at ground level – NOT a diplodocoid or a camarasaur. 2. narrow gauge – NOT a titanosaur or a Pleurocoeline brachiosaur. 3. it’s too late to be a diplodocid, and far too big to be a rebbachisaur or dicraeosaur. It may be Aptian in age to the Albian is not too far off. However dating these things is a major headache in itself, so I’m not claiming to have the final say on any of this. Breviparopus and B. nougaredi may not be the same animal, but they were of similar size, in the same area, in the same geologic period. If the epochs are really so far apart, perhaps they could be ancestor and descendant. But a diplodocid, I think not. You’re making a lot of interesting points here and in other SV-POW! comments, but I do wish you’d document some of your assertions. For example, where does the ideas that only “pleurocoeline” brachiosaurs left wide-gauge track come from? This is a new idea to me, and contradicts (for example) Henderson’s (2006) study of sauropod gait mechanics in which he used Giraffatitan (“Brachiosaurus brancai” of his usage). By the way, if we’re erecting subgroups of Brachiosauridae, then we should not use the term “Giraffatitanoid”, as it alludes to the group “Giraffatitanoidea”, whose -oidea ending implies a superfamily, which would be more inclusive than the family. We could use Giraffatitaninae, which would be a subfamily name and therefore fit neatly within Brachiosauridae, or an ending not covered by the ICZN yielding an explicitly unranked name such as Giraffatitania. BUT if this group includes Brachiosaurus proper, then as this is the type genus of the containing family it would be mandatory under the ICZN to name the containing subfamily after that genus, too, hence Brachiosaurinae (and it would be at least polite to do this even if using an unranked name). BUT^2 the phylogenetic structure — and indeed membership — of Brachiosauridae is so poorly known at this stage that naming and defining subgroups is way premature anyway. As it happens, at least two separate phylogenetic studies of basal titanosauriforms are currently under way, so hopefully we’ll know much more about brachiosaur relationships in a few years. I suggest that we should leave the definition and naming of any brachiosaurid subgroups to the people currently slogging through that hard phylogenetic work. All that said: good point about the “B.” nougaredi sacrum length being likely more reliable than its width. It’s definitely time someone restudied that material. Why are the arteria inside pneumatic diverticuli? isn´t that an odd position? They’re not really inside pneumatic diverticula so much as surrounded by them, if that makes sense. The arteries are there first, and the diverticula form by following the arteries, which they come to surround. This is a pretty late comment, I know, but I recently got a hold of Lapparent’s paper which includes the only known photos of “Brachiosaurus” nougaredi, and I just got a chance to look at it closely today – it turns out I was correct about the sacrum width measurement being skewed… sort of. The measurement of only 80 cm for the sacrum is due to the fact that the sacrum is heavily eroded (not laterally crushed as i had earlier suspected), and most of the left side is gone. The left sacral ribs are broken and very worn down. Lapparent’s measurement of 80cm seems to have been taken near the second or third sacral vertebra (the first sacral is the one that’s missing, or mostly missing – there’s a tiny piece of it at the sacrum’s front end). In any case, even at its widest point, the remaining sacrum is still very eroded on the left side, and still not much more than 80cm wide. The right side however is in better shape, and can be used to restore the shape of the sacrum. Based on the photos, if you assume a length of 130 cm for what remains of the sacrum, the width also comes out to 80cm (again, if you only consider what remains of the sacrum.) I’m working on a scale diagram of the sacrum using Greg Paul’s Giraffatitan skeletal as a guide, and so far it’s getting clear that the original “B. nougaredi” sacrum was a good bit wider than 80cm – roughly around 100cm at the existing second sacral, and as much as 140 cm (estimated) at the first sacral (including the sacral ribs). Interestingly the neural arches of the sacrum are all gone too. The photos show the sacrum laying flat in the ground, with what looks like the neural canal itself exposed (Lapparent mentions the neural canal in the paper too, though my French is not good enough to translate the commentary). If the neural arches simply eroded away that’s one thing… but some of the right sacral ribs look to have a higher elevation that what’s left of the central column – which could (and this is a really big guess here) mean that this was a juvenile animal with unfused sutures in the sacrum. That’s an unlikely but pretty scary possibility, if this was an immature animal then the adult size would be nothing short of legendary. Nima, it sounds like you have much better photos than the ones I’ve seen in Plate II of Lapparent 1960. Could you send me copies, please? I have the same photos I think… they’re pretty grainy but the detail is somewhat visible and it’s possible to see the broken/missing areas. I will send you the copies soon. I’ll also send a version I quickly modded to show the bounds of the bones. BTW, have you had a chance to take a look at my initial “fix” of the Archbishop drowning scene?